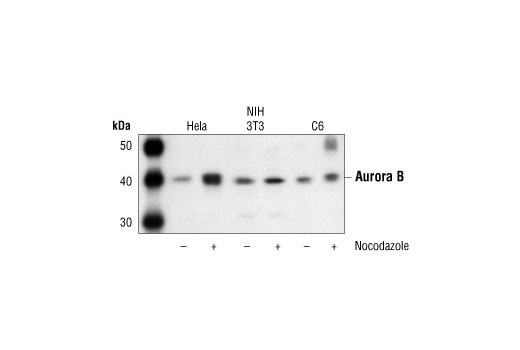 Western blot analysis of extracts from Hela, NIH/3T3 and C6 cells, untreated or nocodazole-treated (50 ng/ml, 24 hrs), using Aurora B/AIM1 Antibody. Flow cytometric analysis of Hela cells, using Aurora B/AIM1 Antibody (blue) compared to a nonspecifc negative control antibody (red). 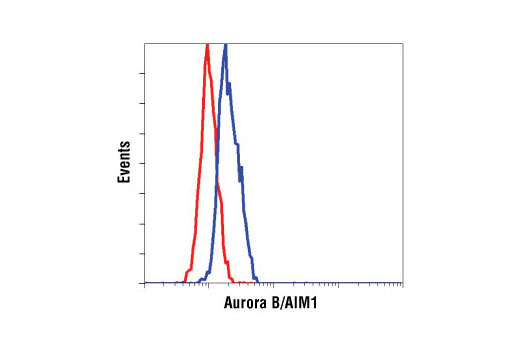 Aurora B/AIM1 Antibody detects endogenous levels of Aurora B/AIM1 protein. Polyclonal antibodies are produced by immunizing animals with a synthetic peptide corresponding to the amino terminus of human Aurora B/AIM1. Antibodies are purified by protein A and peptide affinity chromatography. Aurora A (AIK) is a cell cycle-regulated Ser/Thr protein kinase that is overexpressed in many tumor cell lines (1-3). Phosphorylation of Aurora A at Thr288 within the kinase activation loop results in a significant increase in its activity and may target the protein for proteasomal degradation during mitosis (4). The closely-related kinase Aurora B (AIM1) has been implicated in multiple mitotic events (5), and siRNA silencing of Aurora B expression results in reduced histone H3 phosphorylation, aberrant chromosome alignment/segregation, and altered survivin localization (6). Bischoff, J.R. et al. (1998) EMBO J 17, 3052-65. Zhou, H. et al. (1998) Nat Genet 20, 189-93. Sen, S. et al. (1997) Oncogene 14, 2195-200. Walter, A.O. et al. (2000) Oncogene 19, 4906-16. Kallio, M.J. et al. (2002) Curr Biol 12, 900-5. Hauf, S. et al. (2003) J Cell Biol 161, 281-94.